A kinder person would say that it's something of a tribute to My Dying Bride that I have such a love for them that I feel guilty for only reviewing their latest EP three months after it was released. Not an album; a four-song EP, three of which were leftovers from the Map of All Our Failures sessions. And of course, My Dying Bride are the sort of band that divide opinions – fans will have already heard these songs, and the disinterested won't care about an EP if they don't care about the band's albums. So why make a fuss about it? Well, as a fan, I think it's pretty obvious once you actually listen; this is My Dying Bride in serious contention for the crown of best doom band in the world. Even as 'inferior' offcuts, the songs are excellent. Opening with the title track, the misery begins immediately, slow and melodic riffs introducing Stainthorpe's typically downcast vocals. The lilt of a mournful violin, the deranged whisper, the subtly infectious melodies coming at you from leftfield... this is the band at their most seductive, the song constructing a catchy slow gallop from nowhere and riding it right into your heart. It devolves into Opeth-esque acoustic guitar, nicely setting up the surprise that is the old-school death chugging and snarls of Vår Gud Över Er. Beating a carefully slow beat, the song develops nicely into a doomy drone, Aaron's clean vocals returning with a captivating despairing note. A Pale Shroud of Longing continues the seductive side of the band, the opening theme a slow pound of misery, the track speeding up towards the end without reducing in intensity. And finale Only Tears to Replace Her With ramps up the intensity even more, Aaron speaking rather than singing, a riff tolling behind him like a funeral bell. 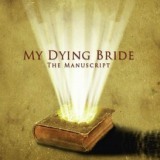 As a whole, of course, The Manuscript lacks the punch that a full My Dying Bride album has, and contains no surprises, but even when not at their strongest the band still write excellent songs, and none of the four here let them, or us, down at all.